The remains of an old road that once took Model T Fords to the top of the San Francisco Peaks provides the route for this winding mountain trail. 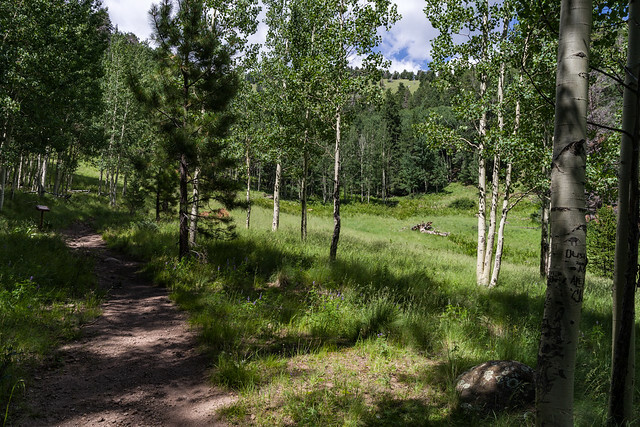 The road has since been closed to vehicle traffic to protect the area's alpine environment, and the upper reaches of the mountain have been set aside as the Kachina Peaks Wilderness Area so forest visitors can enjoy its panoramic views in the relative seclusion and natural surroundings such an area provides. Along the steady but gradual climb, views stretch to Oak Creek Canyon and the Verde Valley over fifty miles away. Trailside vegetation changes as elevation increases, from ponderosa pine to more alpine species such as limber pine, corkbark fir, and bristlecone pine. At about 9,000 feet a very noisy black, gray, and white bird makes its first appearance. This is the Clarks nutcracker, a type of jay, which is more commonly thought of as a resident of the Rocky Mountains but finds this part of Arizona very much to its liking. Black bear are sighted periodically as are wild turkey and blue grouse. The Weatherford Trail is an excellent place to hear the bugling of bull elk in the Fall, as they gather their harems for the breeding season. It's also one of the best places on the forest to enjoy the autumn change of leaves among the huge aspen groves in the mountain's inner basin. Come early, though, the leaves change here well ahead of anyplace else on the forest. The Weatherford Trail ends at its intersection with the Humphreys Trail, which then continues on to the top of Mt. Humphreys the highest point in Arizona at 12,643 feet. Location: 6 miles north of Flagstaff on graveled forest roads. Access: Drive 2 miles north of Flagstaff on US 180 to FR 420 (Schultz Pass Road). Turn left at the intersection with FR 557. Continue on FR 420 for 6 miles to the trailhead located at Schultz Tank. FR 420 closed in winter due to snowpack. USDA FSGeodata Clearinghouse: Arizona FSTopo Maps available for download in Geo-enabled PDF and GeoTIFF formats. Note: USGS 7.5 Minute (1:24K) Topo Maps and FSTopo Maps use the same title. USFS Store: Map Locator & Downloader purchase or download USGS topographic maps. Note: USGS 7.5 Minute (1:24K) Topo Maps and 1:24K FSTopo Maps use the same title. No mechanized or motorized vehicles, including bicycles, in Wilderness. No horse-use or camping beyond Doyle Saddle in order to protect the inner basin watershed.